BoVegas is considered to be a new online gambling platform as it was established in 2017. As the name sounds, it shares the same software with popular brands like Bovada and Bodog. This casino guarantees all players a memorable and immersive gaming experience. The casino is owned and operated by Blue Media N.V. Casinos Ltd and holds licenses from the Government of Curacao. Their online slots will leave you perplexed as they are packed with the finest quality of 3D cinematic graphics and animation. Other games in the library include blackjack, roulette, video poker, and baccarat. Punters can choose to play any of the three platforms, desktop computer, instant play, and mobile. Online Slots: Cai Hong, Eagle Shadow Fist, Buuble Bubble 2, Dragon Orb, Fu Chi, Swindle All The Way, Snowmania, Ghost Ship, Fruit Frenzy, Fame and Fortune and Goblin’s Treasure. 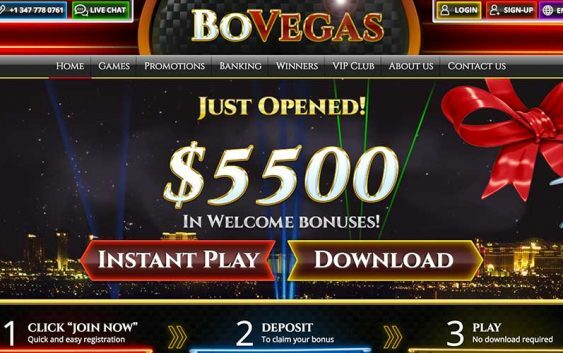 BoVegas Casino is definitely the best when it comes to bonuses and promotions. There is a welcome bonus of 250% up to $5500 with no maximum cashout. Besides the welcome bonus, there are daily rewards of 160% match bonus plus over 30 free spins on specific online slots. The VIP Club at BoVegas is categorized into levels, Play Knight, Royale Elite, Imperial Pro, and Vegas Legend. All player concerns and questions can be forwarded to the help desk via live chat, email, and phone. The customer assistants are friendly and available 24/7.